Matt Beane, Assistant Professor in the Technology Management Program at the University of California, Santa Barbara, recently published two important pieces about robotics and work. The first is in one of my field’s top academic journals. The second is an op-ed in Wired. I’m curious to hear which you clicked on first. (Wired’s Matt Simon has a feature piece about some of Matt Beane’s research in an earlier issue.) All the articles offer insights into what work can devolve to if we aren’t proactive about how we integrate automation and robotics into our work -- in my terminology -- if we don’t learn to Think in 4T. My version of what we should be doing is working to Think in 4T. Like the rich perception we get from seeing in 3D - we need to think and act in 4T when it comes to our work and other activities. You can’t get much done with any one of these “Ts.” You need to Think in 4T. Some targets will be talent focused; others will draw more on technology or the technique of putting them together. Still others will look like an equal mix. As you plan out your projects with your workforce made up of talent and technology, think hard about the right attributes for your situation and the technique you use to put them together. Also, keep in mind that we need to evolve our approaches. There are not, and likely never will be, good cookbooks for the application of new technologies in work. Beane notes: “From the front lines, it seems clear that organizations that take robots as an opportunity to learn will come out ahead.” Technology can be a great start to change, but it’s not the end. We need to be thinking about how targets, our talent, available technologies, and techniques relate to our work. Similar to when you join a new organization you might think about how the power structure will play a role and who you need to get to know, or how to manage the process of being reimbursed for business travel, you need to include your available technology tools and how all these attributes come together. Thinking in 4T helps to ensure that you are covering all your bases. Beane found that the most successful student-surgeons “...often invested many tens and sometimes over a hundred hours of discretionary time on the [robotic] simulator early in their residencies, and this gave them the basic fluency required to earn console time” during the surgeries. These more successful student-surgeons figured out that they had to prepare differently for robotic versus traditional training. I doubt that they started with an explicit 4T assessment -- but what if more of them had? What if they started from the perspective of understanding that their target was time doing surgeries (I’m confident they had that in mind). 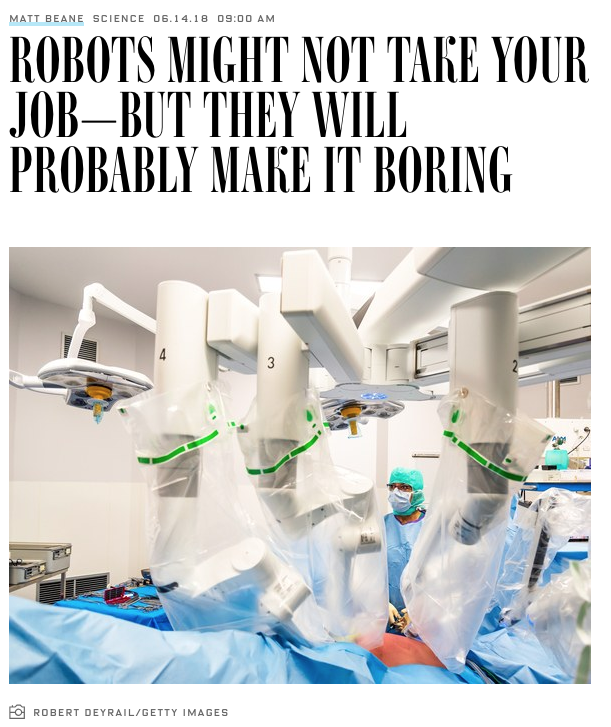 But what if they also realized, or realized more quickly, that in the robotic setting the technology put their work, their talent, under a literal microscope and so they would have to have a higher standard of practice to be allowed hands-on experience? What if the simulators were placed closer to where the surgeons work and given higher priority by the students and their supervisors (technique)?